Rise and Shine is an arcade puzzle-platformer from Super Awesome Hyper Dimensional Mega Team and publisher Adult Swim Games. It originally released on Xbox One and PC back in early 2017. But as a love letter to the golden age of 2D gaming, it only seems fitting that the game should receive a port to a Nintendo console. Does this indie arcade romp’s bark match its bite, and how does the game hold up on the Switch? Oh, you were expecting me to answer these questions right off the bat? Read on to find out, but pay attention! There just might be a quiz at the end. 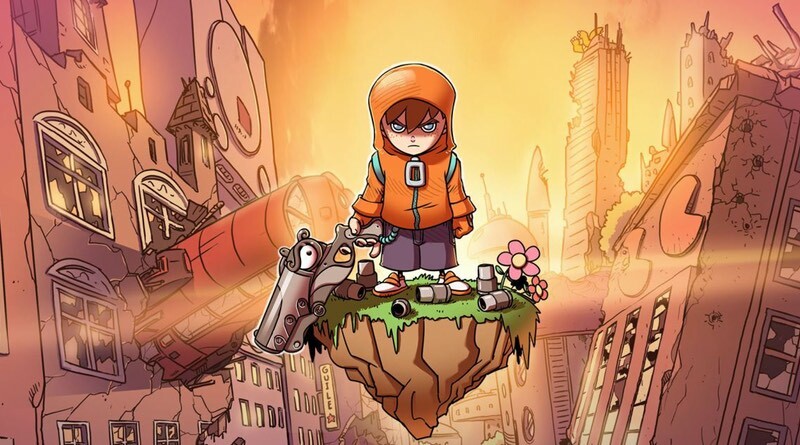 In the game you play as Rise, a young citizen of Gamearth, a fantastical video game themed world that I can really only describe as Wreck-It Ralph if it were drawn like a Saturday morning cartoon and written by a snarky Reddit comments section. Just as his planet’s defender is slain in battle, Rise is given Shine, a smart-mouthed, sentient handgun that binds with whomever is wielding it, granting them unlimited respawns. The newly formed duo is then sent out into the war torn Gamearth, in search of answers for these mysterious attacks. While the story follows a very simple “take your magic weapon and go save the world” premise, Rise and Shine is bursting at the seams with charm. The realm of Gamearth is a confusing mash up of every piece of video game lore you can think of rolled into one. Gamers are referred to as “guides” and they are worshipped like gods in this world. Virtually every line of dialog delivered in the comic book style cut scenes contains a joke or reference to video games. All of this is brought to life by an epic soundtrack and absolutely breathtaking hand-drawn art style, making every environment just a joy to roam around in. The art style alone makes it worthwhile to play through the game multiple times because there are even more jokes, references, and just all around beautiful set pieces throughout the landscape of the Gamearth. Much of the gameplay is based around the main mechanic of combining puzzle-platforming with arcade style shooting. As you progress through the side-scrolling environments, you encounter robots, missiles, debris, and other obstacles blocking your path. Your job is to utilize Shine’s unique abilities to find your way through the obstacles, all the while dodging waves of enemy attacks. In between these sections, you’re treated to some light platforming and cover based shooting. At the very start, you’re greeted to a brief tutorial to ease you into the controls. The game utilizes a unique twin-trigger system for Shine. You hold the left trigger to draw your weapon, shoot with the right trigger, and then guide your bullets with the right analog stick. You use the left analog stick and the face buttons to control Rise. While the system is definitely not a friendly one to novice players, getting the controls down can lead to some incredibly intuitive gunplay. The puzzles are incredibly rewarding to solve and are just fun to blast through on multiple plays. As a port to the Switch, I didn’t run into any problems with frame rate or glitches either in docked or handheld mode. The game handles perfectly with the Switch Pro Controller. However, the smaller travel distance of the Joy-Con analog sticks made some shots a little bit harder to pull off in handheld mode, but it doesn’t break the game by any means. Rise can’t take that much damage so most the game’s challenge comes from the constant need to keep your character moving to avoid fire, while still having the precision needed to solve the puzzle blocking your way. The result is a lot of trial and error on your first play-through and even on the game’s normal difficulty you should expect a lot dying – beautifully gruesome, adorably hand-drawn death. I don’t mind games where you have to trial and error your way through. However the only major complaint I had with the game was actually with the dying animation. Every time your character is fatally hit, the screen does a classic faded red border and you get to watch your head fall to the floor in slow motion as “press any button to respawn” begins to flash on the screen. Pressing a button will cause the screen to fade to black for a few seconds before you’re brought back to your last checkpoint. All told the animation takes about five seconds to play, which doesn’t seem like much, but given the amount of times you’ll probably meet your death it begins to really whittle your patience down to nothing. Games like Celeste manage to get you back in the action much faster and that’s very much appreciated. While such a mad difficulty curve may turn off novice players, Rise and Shine isn’t completely unforgiving. There are no time limits for any of the stages, you have unlimited bullets so you don’t have worry about ammo management, and Shine’s magical ability grants you unlimited lives, basically leaving you free to go at your pace and fail as many times as you need to in order to finish the game. If you’re not terrible at arcade shooters like I am though, the entire campaign can be burned through in about two hours. When all is said and done there’s a decent amount of fun to be had here, but nothing that will rock your socks off. Rise and Shine is a colorful and hilarious, if a bit short, adventure through an incredible gaming inspired world. Arcade fans, indie fans, those who aren’t afraid of a few hundred deaths, all will have a lot of fun with this title. If you haven’t checked out this title yet, it would make a great addition any indie gamer’s library. Rise and Shine was reviewed using a final retail Nintendo Switch download code provided by the publisher.